Many people don’t realize the fact, but the Northwest Coast art market is flooded with forgeries. Made in Asia, these forgeries sell are imported by the hundreds, selling for a fraction of genuine pieces. Often, they are low quality, and show little knowledge of local traditions, but a few of them show a reasonable level of skill, and even include forged signatures of well-known artists. Spend some time in galleries to see what regular prices are, both for the kind of work and for a particular artist. Forgeries will usually be 20–50% of the standard prices. Although you can sometimes find genuine bargains – for instance, the work of new artists — in most cases if the price seems too good to be true, it probably is. Buy directly from reputable galleries or artists. Someone selling on the streets is unlikely to be genuine, and, the further removed from the artist a sale is, the greater the chance of forgery or fraud. Talk to the seller about the piece. Be suspicious if the seller cannot talk knowledgeably about what it represents or how it was made. Beware of simple, general explanations about the piece, such as the claim that a depiction of a wolf symbolizes courage or an eagle soaring ideals. Ask the seller where they studied the art, and with whom. 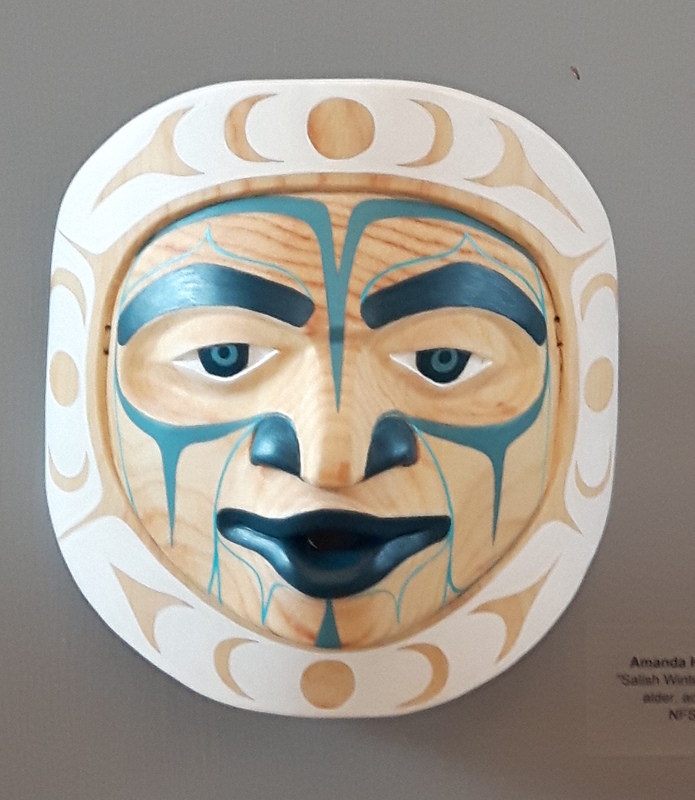 Traditionally, Northwest Coast art has been passed down from teacher to student, and genuine artists are quick to mention their teachers. By contrast, be skeptical of people who claim to have been adopted by a First Nations group, or to have received a blessing – claims that appeal to the stereotypes of First Nations, but have little to do with the realities of the cultures. Check what materials are being used. 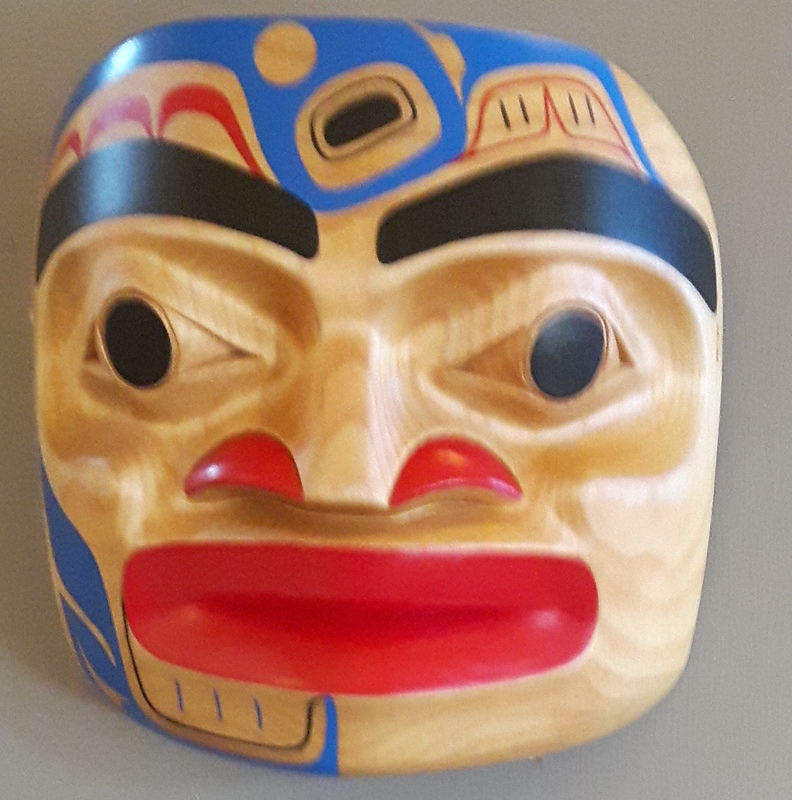 For instance, although legitimate First Nations artists sometimes experiment with other types of wood, the most common types are ones found on the northwest coast, such as red or yellow cedar, alder, and yew. By contrast, the forgeries are usually made from Asian hardwoods, such as mahogany. Argillite pieces are usually legitimate, because the Haida control the supply, although a few pieces are sometimes sold to others. If you don’t know who is reputable, ask around galleries and online for recommendations. If you are buying privately, ask for some indication of authenticity. When you can, see the signature on a genuine piece and compare it with the signature on a piece you are considering buying. If it looks totally different, it is a forgery. However, beware of it looking too much the same, too, because no one ever signs their signature exactly the same each time. If you have a picture of a piece you want to buy, use it to search online to see if a similar design exists from another artist. Educate yourself about the art by spending time in galleries or reading books like Hilary Stewart’s Looking at Indian Art of the Northwest Coast. Although the art is intricate, it is also stylized, especially the formline tradition of the northern First Nations. Asian carvers copying from pictures rarely have the knowledge to follow any existing tradition accurately. 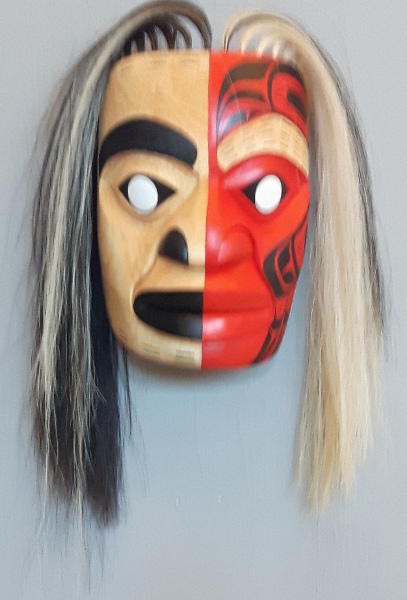 Not only does knowing the traditions teach you what to look for, but, if you know the tradition, you can also tell when the seller is using phrases like “transformation mask” incorrectly in an effort to impress you. A single one of these precautions may not be enough to help you avoid forgeries, but several together should be. The sellers of forgeries count heavily on the ignorance and prejudices of buyers and the wish for a bargain. Respond with caution and common sense, and you have a better chance of seeing through their deceit and of not buying a worthless fake. 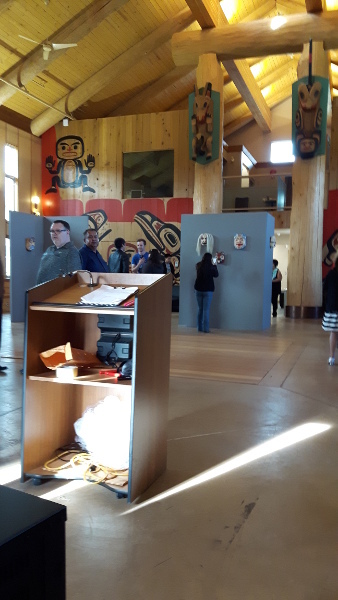 When I attended the Freda Diesing School’s year end exhibit last April, I was the first in the doors when the campus longhouse was opened. As I stepped in, a mask caught my attention from across the room. The closer I came, the more I admired it. Eventually, I checked the artist, who turned out to be Jamie Katerina Nole, whose “Pregnant Frogwoman” print I bought several years ago. I hovered waiting for Nole, and, as soon as she arrived, I bought it – and who can blame me? “Princess Luna” is a piece of carving that starts with solid foundations, and consistently makes an extra effort that produces an outstanding work. Of course I could not have foreseen that, through a series of misadventures that were no one’s fault, I would take four months to receive the mask. However, the delay only makes me appreciate the mask all the more. As the name suggests, “Princess Luna” is a moon mask. Moon masks are common at the school, because the moon is not a family crest, but often they are learning exercises at best. The basic design consists of a face surrounded by a ring of U-shapes or ovoids and “Princess Luna” obviously begins with that design, although it soon heads off in its own direction. To start with, the mask is made of alder, a pale wood that through a combination of selection and sanding seems suitable for the moon. 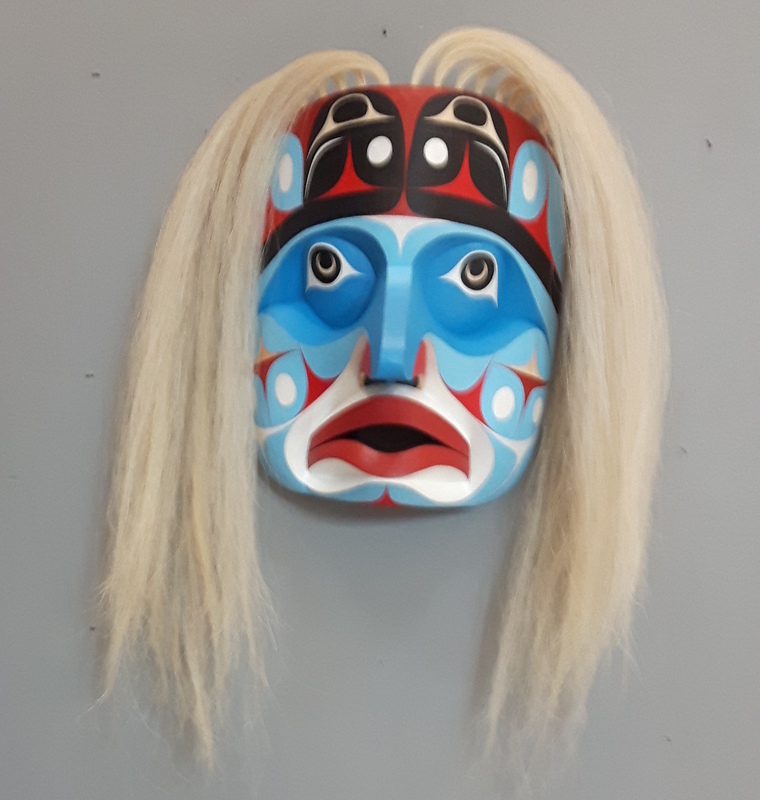 Both the painting and the copper labret are restrained, and the face itself is more realistic than that of most moon masks, with closed eyes that create a sense of serenity and mystery that is reminiscent of standing in the light of the full moon. 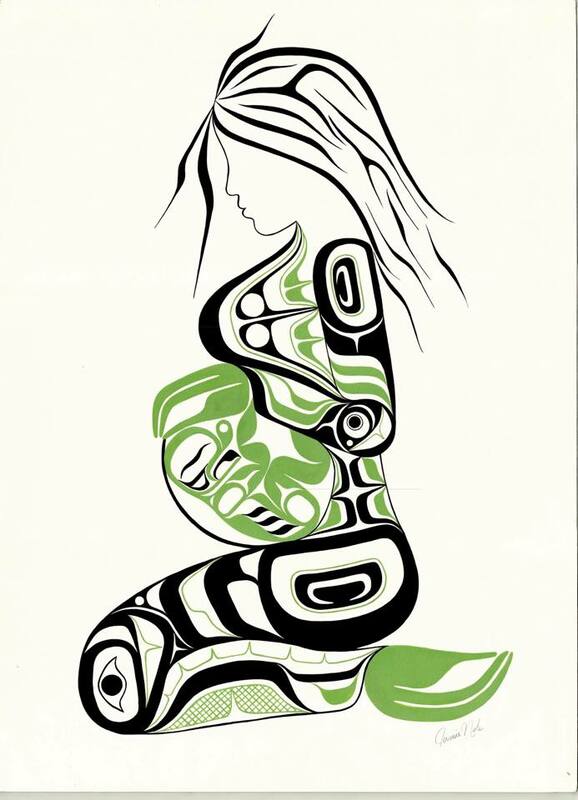 Like the “Pregnant Frogwoman,” print, the result is a sense of emotion that is rare in northwest coast art. Similarly, the decorations around the rim can be viewed as covering the phrases of the moon, with the blank ovoid at the top the new moon, and the full moon at ear level on both sides of the mask. Just these basics would be enough to make the mask more than a classroom exercise, but they are just the beginning. 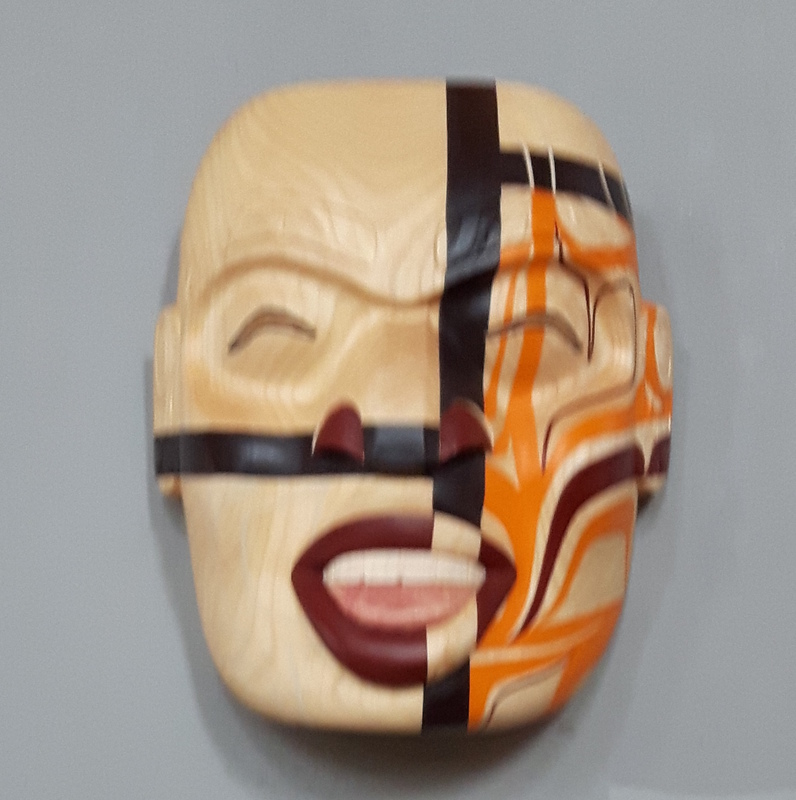 At the bottom, the stars are indicated, with cutouts and two loose rings cut from the same piece of wood as the rest of the mask – an impressive and seldom-seen display of skill. Turn the mask over, and the phases of the moon are shown again, although few people are likely to see it. The back of the mask, showing the phases of the moon. Notice, too, the smooth finish on the back. Yet the greatest extra effort is the use of luminous paint. If, like me, your eyes see some distance into the ultra-violet, this luminous paint adds to the sense of wonder in the mask by creating a sense of something that cannot quite be seen. 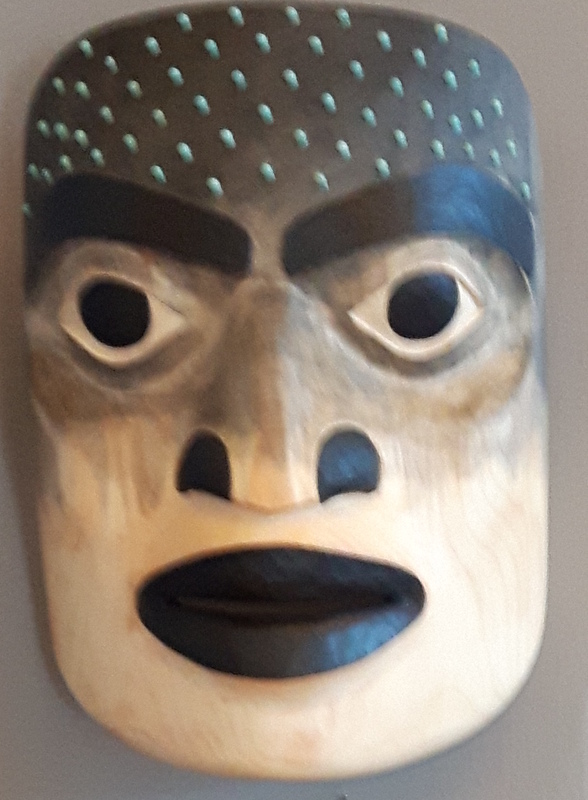 In the twilight, the pale wood turns almost golden, and, under black light, creates an entirely different look to the mask, transforming it into a figure of power more awake that the mask appears under ordinary light. “Princess Luna” by black light. Nole is still experimenting with different styles. 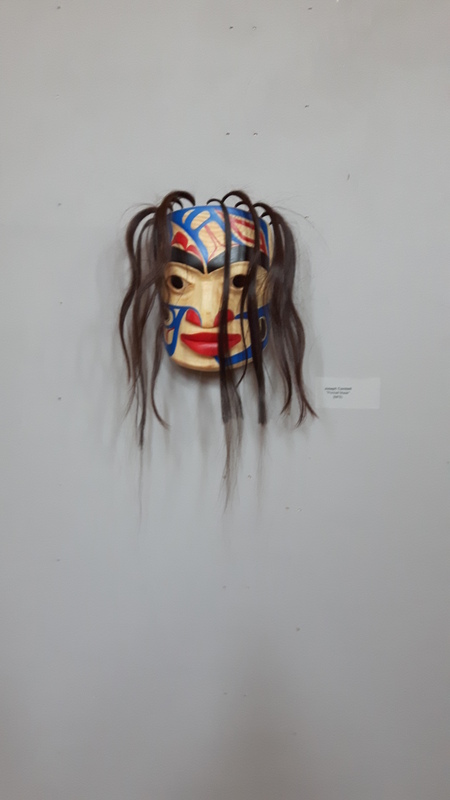 The Northern Exposure show included another two more of her experiments, “Trickster Flow,” which places a Modernist design across a conventional portrait mask, and “Raven – Don’t Froget Me Crest,” a frontlet painted in a non-traditional style. Neither is as successful as “Princess Luna,” but, like it, they create the impression of an innovative artist who is prepared to make the extra effort to produce original work. Nole has clearly made intelligent use of her time at the Freda Diesing school, and “Princess Luna” is proof that “The Pregnant Frogwoman” was a start and not just an accidental success. I can’t wait to see what she carves next — or what she will be carving in another twenty years. 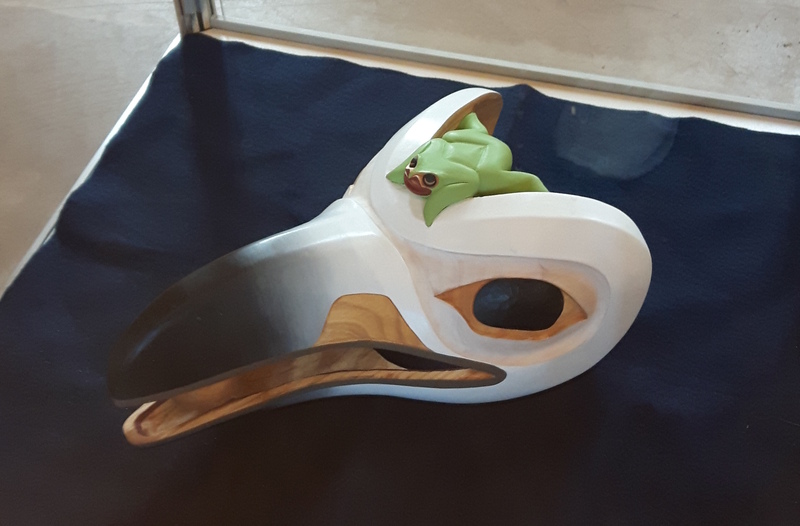 In the renaissance of Northwest Coast art, the story of how Raven stole the light is the equivalent of the Madonna and Child in classic European art: sooner or later, most artists produce at least one version of it. Several years ago, I bought Bill Hudson’s version of the story, which shows Raven opening a box labeled Sun Crispies as he sits down at a kitchen table. Now, in James Crawford’s “Raven Steals the Lightbulb – Unscrewed,” I have found another modern updating of the story. If anyone knows one story from the local First Nations, it is the story of how Raven stole the light from the chieftain who held in locked in his chest. Raven turns himself into a pine-needle and has himself swallowed by the chieftain’s daughter so he can be born as her son. The chieftain dotes on his grandchild, and one day gives him the light as a toy – and Raven promptly flees with it, burning himself black as he escapes through the smokehouse of the longhouse, and scattering the sun, moon, and stars, accidentally creating the world as we know it. With variations, the story is told in many different cultures. Usually, the depiction has Raven holding a sphere of light in his beak as he flees. Crawford gives a modern rendering of this familiar scene. It is evidently a supernatural light bulb, since it appears to be still radiating light after being unscrewed, and in the upper left is what might be the rising sun. Raven looks mischievously pleased with his theft, or perhaps with the updating of the well-known scene. However, the print is more than a one-punch piece. Instead, it is one of Crawford’s experiments with lino block prints: images that are carved, then inked and used as a stamp. It is a seldom used technique, although Stan Bevan, one of Crawford’s instructors at the Freda Diesing School, released at least one block print of his own. The effect is totally unlike any other medium, with irregular lines, and an often blocky appearance. It reminds me of the woodcuts in books from the 16th and 17th Centuries, which used a similar technique. The result gives Crawford’s print the eerie impression of being an artifact from some alternate universe in which the local First Nations had European-style printed books. Needless to say, block prints require tremendous care when they are printed, especially when more than one color is used. Consequently, the print is small, roughly 12 by 25 centimeters. However, the effect is so appealing to my eye that I plan to buy some of Crawford’s other block prints – and to keep an eye on his work in other media as well. I missed the 2016 Freda Diesing School’s graduate exhibit, so attending this one meant all the more for me. The moment I walked into the campus longhouse, with its carvings, natural light and high ceilings, I immediately felt at ease. Within moments, I was circling around the exhibit, trying to get pictures while staying one step ahead of the crowd. This year’s show included a skillful piece by instructor Dean Heron, an alumnae of the first graduating class. I was glad to see it; focusing on his teaching, Dean does far less carving that I would prefer. However, the emphasis was on the students’ work. The classes of 2017 were some of the stronger ones of recent years, with several outstanding graduates of the program and a promising collection of first year students. I found myself dividing the pieces displayed into those whose main appeal was their painting, and those whose appeal combined both painting and carving. It takes a steady hand to paint convincingly – a steadier one than I have ever had – and the exhibit included several examples. Joseph Campbell, Lorraine Wolf, and Roger Smith all hung portrait masks with a steady hand and palettes of primary colors. 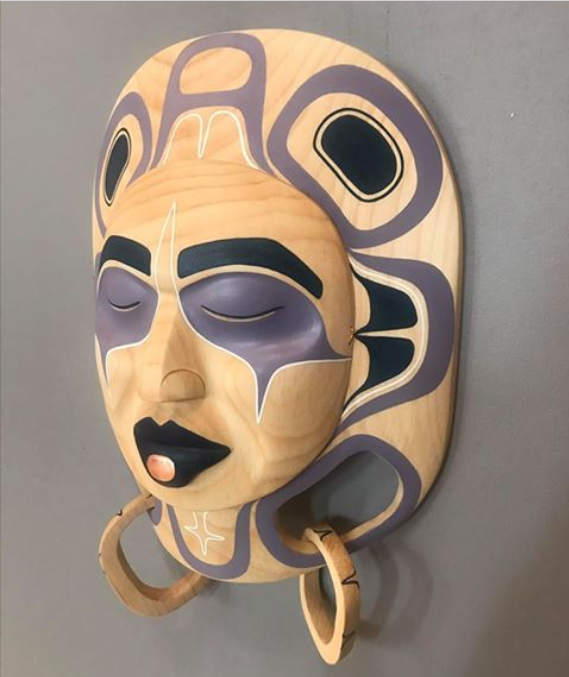 In her moon mask, Kari Morgan took another direction with a minimalist white that put the emphasis on the finish of the wood and her carving. 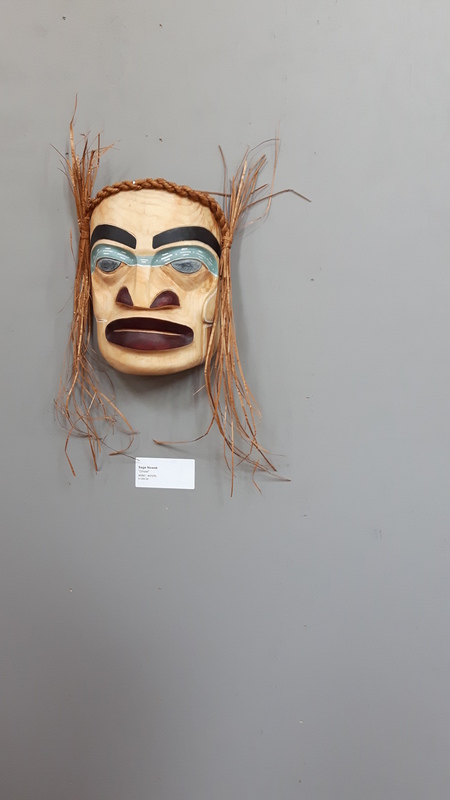 More exotic were Sage Novak’s “Ghost Mask” and Violet Gatensbury’s “Fire Mask,” which blended paint skillfully into the wood and also featured rows of beads on the mask. 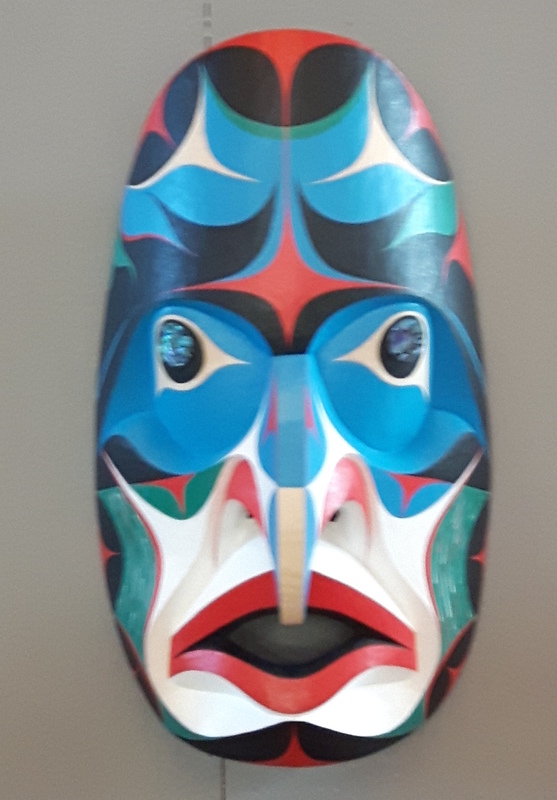 Among those with both strong painting and carving were Raven LeBlanc’s Dogfish mask, which rapidly went on my shortlist of possible purchases. By contrast, Nole submitted three masks in three very different styles: the “Don’t Froget Me” frontlet, the “Trickster Flow” portrait mask, and the “Princess Luna” moon mask. With an unlimited budget, I could have willingly bought most of these masks, assuming they had been for sale. However, since my parents refused to let me be born rich, I could only buy Nole’s “Princess Luna” – to my eye the pick of the show In fact, it caught my attention from across the floor as I stepped into the exhibit, and within twenty minutes, I was begging to buy it. All these masks, and possibly more, are scheduled to be in the 2017 Northern Exposure show opening on May 27 at the Spirit Wrestler Gallery in Vancouver. 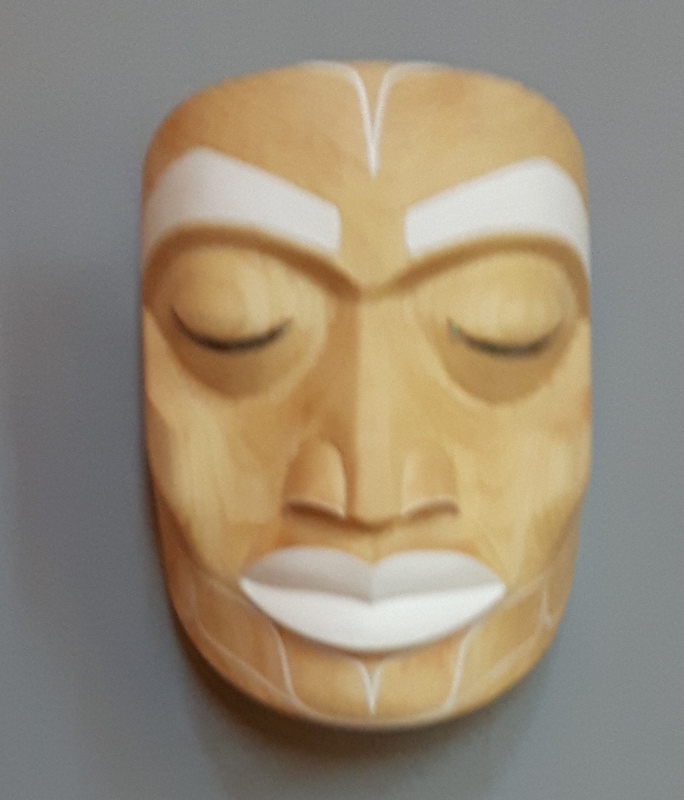 If you have an interest in First Nations art, take the time to have a look at them in person. Even if you don’t buy, the pleasure of seeing what has become one of the biggest yearly exhibits in British Columbia is too great to miss. Believe me, I won’t make the mistake of missing it again – and neither should you. The print honors the Tahltan bear dog, which officially became extinct about fifty years ago. Dog owners are now trying to recreate the species from crossbreeds. Whether this effort is an honest effort or a scam is a matter of dispute, but you can understand why the idea captures people’s imagination. About half a meter high, the Tahltan bear dog was mostly black, with erect ears and a tail that has been described as a shaving brush. Double-jointed, they were able to move quickly through the forest. Hunters carried the dogs in packs on their back, releasing them to surround the bear and distract it with their yaps and attacks until the hunters caught up. At home, they were known for the gentleness as well as their loyalty and intelligence. 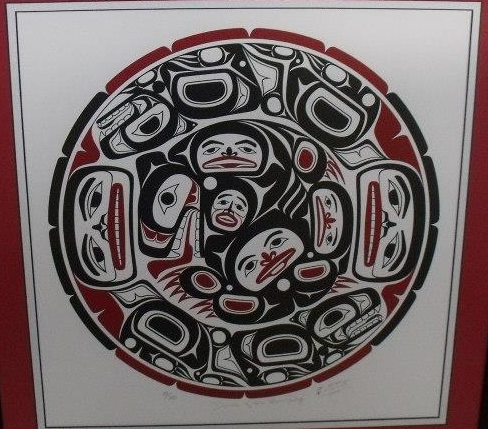 Dennis’ print shows the moment when the hunters and the dogs have surrounded the bear, which is huddled in the middle of the design, its claws bristling and red, as though it has drawn blood, but its open mouth and lolling tongue suggesting that it is tiring. The human faces are set in grimaces of exertion, while the dogs are crouched low with an intentness as though they are keeping close watch on the bear and are ready to leap out of the way if attacked. 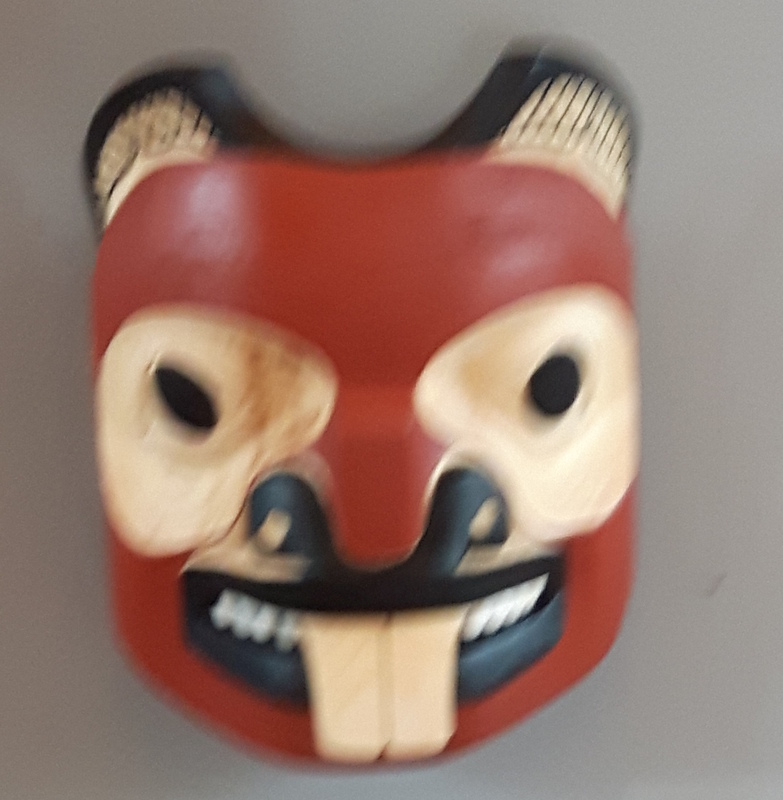 The design is striking for its limited use of red as a secondary color, which makes its uses on the mouths and the bear’s claws all the more striking. It is a darker red than is usually seen in northern designs, suggesting the blood being shed by all those involved in the hunt. The form lines, too, are particularly interesting, with the thin lines of the hunters’ chins suggesting vulnerability in contrast to the thick, powerful lines of the bear’s body. By contrast, the strength of the dogs’ bodies is suggested by two thick ovoids, while the relative thinness of the legs suggesting agility. However, what makes the design so effective is the crowded, concentric circles of action. Many northern designs, especially modern ones, are defined as much by their white space as the design, but Dennis has chosen a busy dance that reflects the chaos of the hunt. This chaos is suggested even further by the way that the outer abstract ring gives way to to the second ring of hunters and dogs, which in turn gives way to the asymmetrical design of the bear and hunters that spirals down as though descending into a drain. Dennis’ accomplishment is to suggest a rarely seen sense of movement and action while using nothing but traditional forms – a combination that makes the description of the moment as a “dance” a precise choice of words. Dennis is not a prolific artist. The fact that much of his work is apparently for family and ceremonial purposes makes his works for sale even rarer. As a result, the pieces available for sale are relatively few. However, on the strength of “The Dance of the Bear Dog,” I will be watching eagerly for more to buy. I first became aware of Nuxalk artist Latham Mack when I visited Terrace for the Freda Diesing School graduate exhibit. 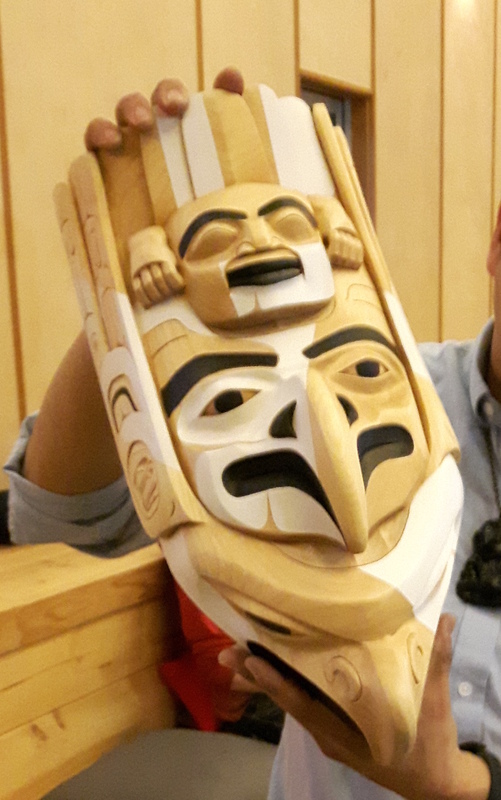 He had already won one YVR scholarship, and would go on to win another, and his paintings and drawings were among the best in the class – so much so that the teachers gave him the privilege in his second year of working in the Nuxalk rather than the Northern tradition. In fact, when he showed me a sketch for a painting of the Four Carpenters, I said I would buy it sight unseen. However, that painting was never done, and at the time his sculptural work was no more than competent, the best feature of his masks being the painting. Mack’s patience and hard work, though, mean that his story today is very different. Under the mentorship of Dempsey Bob, Mack has become one of the outstanding carvers of his generation, and the prices of his work should soon edge beyond my affordability. So when he showed me his relatively inexpensive “Grizzly Bear Spoon” outside Dempsey Bob’s “North” exhibit in 2014, I jumped at the chance to buy. I had to wait six months while the spoon was on display at the Richmond Art Gallery, but in early 2015 I finally carried home an example of his work. My understanding is that Mack began the spoon while still at the Freda Diesing School and finished it in 2014. Certainly its quality and execution is closer to that of his current work than his student masks. 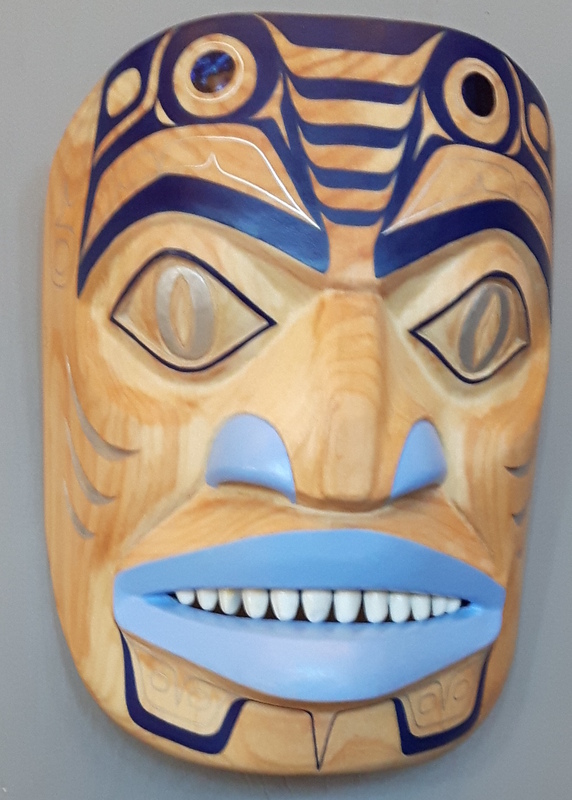 If I didn’t know Mack’s connection to Bob, I might have guessed it by the minimal paint job, although Mack does use what I mentally tag “Nuxalk Blue” around the eyes and ears. The wood is soft to the touch, and the lines of the paint completely straight, both signs of a highly-finished work (and, in the case of the paint, a steady hand. What I especially like is that, with the minimal paint, the contours of the grain because as much a part of the result as the carving. Adding to the piece are the proportions and curves of the spoon’s bowl. They are framed by the legs, with the knees marking where the bowl begins to widen, and the descent of the bowl’s curve by the calves. Further up the handle, the start of the bowl is framed by the claws. Most of the body is simply carved, with the roundness of legs and arms emphasizing the wood’s grain. But what really catches the eye is the depth of the carving on the head. Typically, deep carving is a sign of excellence in northwest coast carving, and this spoon is no exception. The tip of the chin is at least three centimeters from the base of the neck, and the inside of the mouth slightly more. The lips are half a centimeter thick, the eye-sockets symmetrically about the same. The result is dramatic, especially when painted, and even more so in dim light. Currently, “Grizzly Bear Spoon” sits on a tea trolley in my living room, where I pass it twenty times a day and my glance can hardly help but linger on it. I suppose it is a minor work compared to Mack’s larger pieces, but between the curves, the grain, and the depth of the carving, I consider it every bit as much an accomplishment.